A top class kitchen renovation designed by Michael Simpson of The Kitchen Design Centre for "The Pyjama King" Peter Alexander & partner, Hairstylist Tony Reynolds. An impeccable space, with a bright & open environment, fresh timber floors, complementing the focal piece, the kitchen island set in Caesarstone London Grey™, matched with crisp white cabinetry, soaring floor to ceiling sliding doors, leading onto outdoor alfresco area with 180 degree views of lush greenery. "We knew we wanted the marble look... We would have loved to have used real marble, but the maintenance & care was a huge issue for us. With Caesarstone surfaces, we loved that we could get the same look as marble, without the maintenance and the obvious expensive pricetag for natural marble. So that's a Win, win! Caesarstone is so easy to clean & has the best colour range in 'marble-look' stone surfaces." This is a kitchen so pristine, you won't want to cook in it... However, this was not the case for Tony & Peter. Tony loves to cook - so it was a must for The Kitchen Design Centre to design a kitchen that fit their brief. 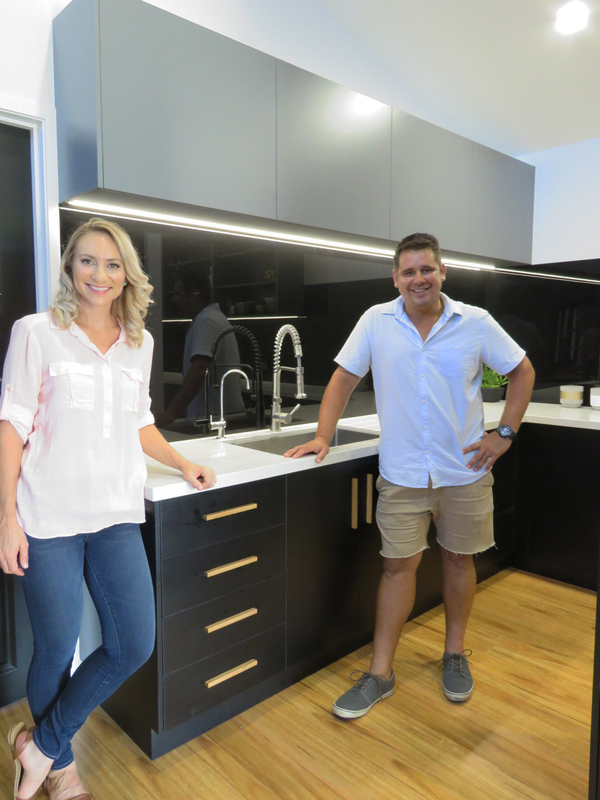 Featured in Melbourne Kitchen & Bathroom Design magazine, Tony shared his honest thoughts on his must-have requirements for the new kitchen project and why he chose the The Kitchen Design Centre. "My kitchen gets a good workout every day, probably more than most. We're constantly filming, recipe testing, photo shooting, as well as cooking three meals a day for my family. My kitchen work surfaces are the most used in the house and it's just not possible to compromise on looks or practicality. Caesarstone is the only choice for me." 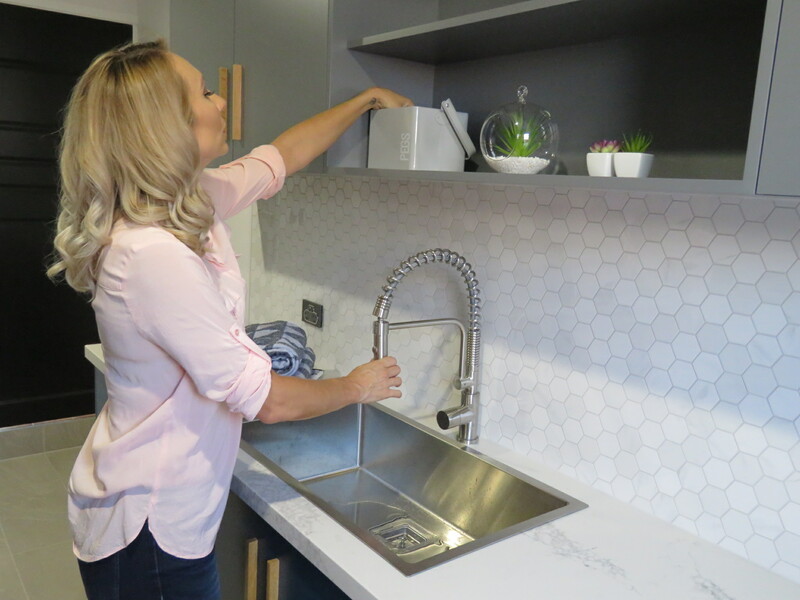 Due to an unfortunate flood in her home, Christina Applegate decided it was time to finally upgrade her kitchen from the old and original design from when the house was first built. It lacked the core elements of a modern home - functionality, comfort and charm. 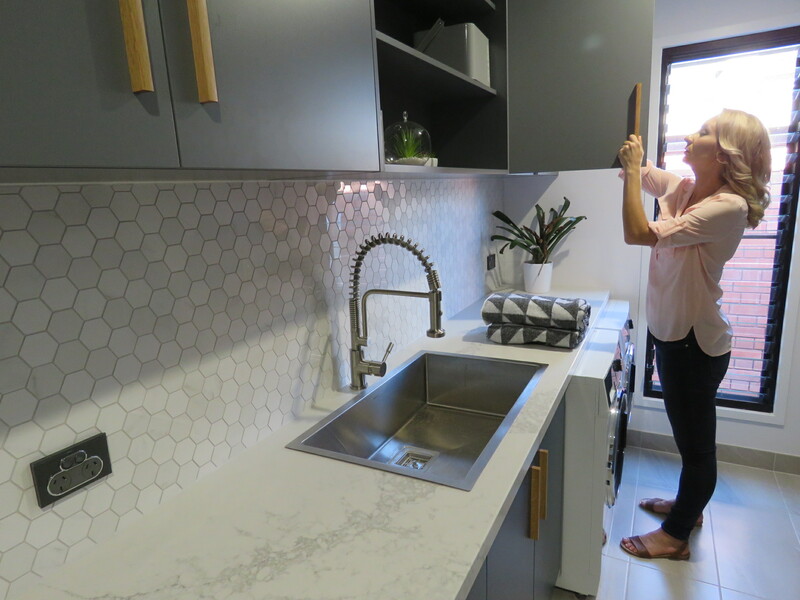 For the new kitchen, Christina sought a design that would incorporate a lot of pantry space, clean lines, overall warmth through improved lighting and of course new quality appliances, . Jessica Today, Designer at Laurel & Wolf chose a classic white colour scheme to make the space feel more free, open and welcoming so it was a simple selection by featuring Caesarstone Pure White™ bench tops for the Island and surrounding benches. Tommy Hilfiger set himself a task in refurbishing his 14,000 square foot Miami Beach home and brought in Designer - Martyn Lawrence Bullard to oversee the design. With a tremendous love of all things ‘60s and ‘70s inspired, each room had impact, with just the right amount of balance. Within the kitchen a classic monochromatic theme using Caesarstone surfaces in both black and white for the bench tops & kitchen island. The same monochromatic trend carries through to Tommy’s bathroom whilst, Dee’s bathroom softens the palette to olive and ivory, both his & hers bathrooms feature Caesarstone counters. Caesarstone was used throughout the home with Pure White surfaces chosen for the kitchen, Jet Black used in the butler's pantry and Snow used for the bathrooms. Having hosted the Oscars, wrapped the final season of How I Met Your Mother, earned a Tony Award for his leading role in Hedwig and the Angry Inch on Broadway, getting married and moving to New York, it's fair to say that Neil Patrick Harris leads a life busier than most - and that was in 2014. Best known as the title character in Doogie Howser, M.D. and his role as Barney Stinson in the hit show How I Met Your Mother, Neil Patrick Harris together with his partner David Burtka have just completed a renovation on their New York townhouse which will serve as a sophisticated sanctuary for their growing family. The transformation of the late 19th century townhouse which was formerly used as a bed-and-breakfast was orchestrated by interior designer Trace Lehnhoff in collaboration with architecture firm Povero & Company. The project took 14 months to complete and included a brand new, fully-equipped kitchen featuring Caesarstone benchtops and Wolf appliances. As avid entertainers and partner David Burtka trained as a professional chef, the kitchen was far more than just a showpiece and needed to be both practical and functional for their frequent dinner parties which the couple would often throw for friends and family. "When I'm talking to clients about what their wanting for their kitchen countertops, durability is usually always the most important thing and second comes aesthetics. Caesarstone puts out a great product and covers both of those things." As a world champion professional surfer, Mick Fanning is a quintessential Australian icon for whom the beach vibe is more than just an interior design trope, but rather a way of life. With the understated, subtlety of the back-benches set in Caesarstone Snow, accompany the gloss white cabinetry and herringbone tiled splashback, which allows marble-inspired Caesarstone Statuario Maximus to make a full statement within this space. A simple, contemporary & minimal spce with a touch of Mick Fanning. French chef, restaurateur, pop-up impresario, author & television personality. As an internationally renowned French chef, restaurateur, pop-up impresario & author - Chef Ludo, definitely knows what he needs in a kitchen. Chef Ludo turned to Caesarstone when it came time to renovate his personal kitchen, and what a masterpiece it is! A combination of industrial & organic style, using a selection of Caesarstone designs throughout. For a fresh & airy visual vibe, Caesarstone Snow & Calacatta Nuvo surfaces were selected by interior designer Ginny Capo. The luxurious, marble-inspired veining provided extra depth, with the added je ne sais quoi to the prepping surface. It’s a pleasure to see Caesarstone surfaces used in the personal kitchens of professional chefs, proving that the functionality and great design offered by our quartz surfaces have a place in both professional and home kitchens. The kitchen has always been know as the heart of the home. Caro & Kingi knew they wanted the kitchen to be open and faced towards the living area so the whole family can be in the one area the same time! "When tackling a massive renovation we always recommend start in your kitchen. Plan and design the kitchen first and the rest of the house will flow from it. Once you have this sorted you know your colour palette and can always refer back to it if you get overwhelmed down the track." You would have most likely heard that "Black is the new White" when it comes to kitchens - regardless of little hand-marks, black kitchens are definitely a trend moving forward, so there is no right or wrong answer. Kingi's signature Marrakesh render over the island bench suits the Industrial-style Caro & Kingi we're after, so they decided to go with the Statuario Maximus™ design as both materials really complement each other and bring out the beautiful vein of Statuario Maximus™. There were definitely some areas of this kitchen that we changed in the spare of the moment and I think that’s the best way to approach renovations. "You have to be open to change and accept sometimes things don’t always go to plan, which messes with my OCD but you just have to roll with it as there’s no point in stressing about things you can’t change. Lesson 1 learnt on The Block!" Natural earthy tones accompanied by white, bright and light surfaces. A stunning open space, exposing stuctural beams leading up to cathedral height ceilings, a myriad of glass, bi-fold windows & shutters flooding in natural light over the dining, living & kitchen. "When designing the kitchen and laundry for our latest renovation project The Pavillion in Kew, we wanted to combine marble on the island bench with the classic beauty and practicality of Caesarstone Snow on the back bench and in the laundry." 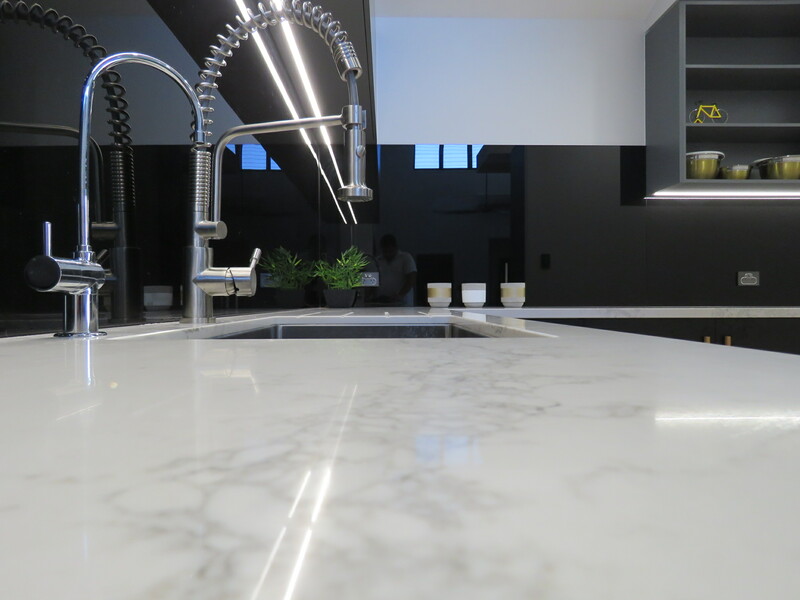 We were very aware that while marble looks good, it comes with many care and maintenance issues and so we wanted to make sure that the most used spaces in the kitchen and laundry were durable, low maintenance and still beautiful - we couldn't go past Caesarstone Snow to tick all of those boxes." 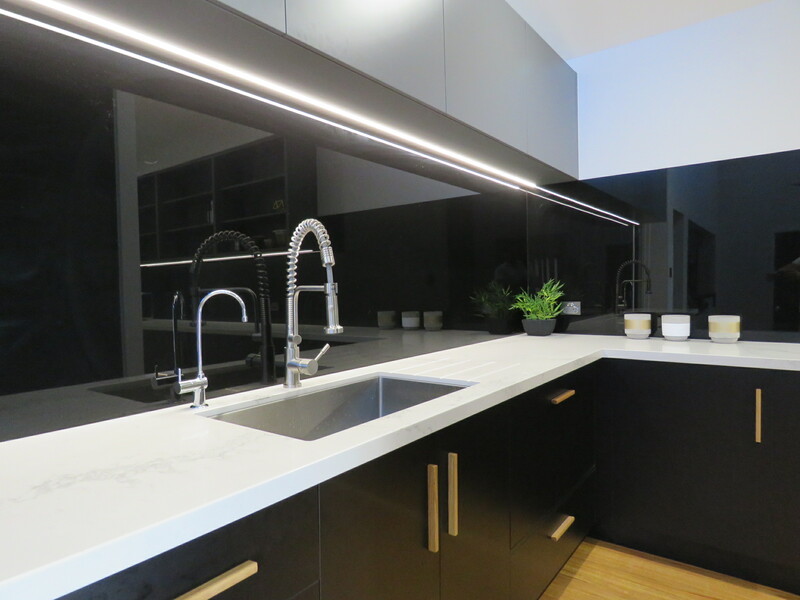 "The previous houses I have lived in featured timber, stainless steel or laminate bench tops so when I finally got the chance to design my own home I knew exactly what I wanted for my hard wearing surfaces.... Caesarstone!" 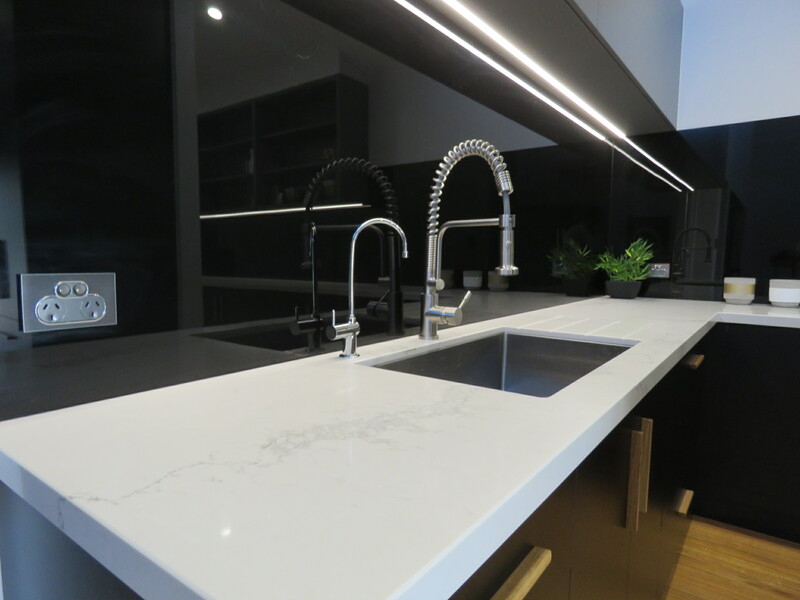 " I actually had the stunning Caesarstone Calacatta Nuvo picked out before I chose the colour or finishes of my kitchen and loved it so much I also continued it up the walls as our splash back. Our bench tops not only look stunning, but are incredibly family friendly, durable and low maintenance which ticks all the boxes for me!"